Large fans sprayed water over the crowd as temperatures climbed to 44 degrees Celsius. “Thank God it hasn’t been too crowded this year. There hasn’t been a big rush,” said Mohammea Osman, 27, who regularly attends hajj. Mina was the site of a 2015 stampede which saw more than 2,300 pilgrims crushed or suffocated to death. Authorities have since reinforced more stringent safety and security measures. Roads from Muzdalifah – another holy site where pilgrims spent Monday night – to Mina were littered with plastic water bottles as sanitation workers scrambled to remove them. Bangladeshi Moueeneddine Ahmad, 35, complained of the scorching heat but said he was “very excited” to take part in the stoning of the devil ritual. Pilgrims streaming to the Jamraat for stoning of the devil. They stoned the devil every year and he is still alive and kicking. Ahmad also praised the Saudi government for keeping the peace throughout the hajj. “There’s a lot of security. Very disciplined,” he said. Most of the pilgrims have completed the first stage of throwing stones known as the Great Aqaba today, after arriving from Muzdalifah to Mina since early morning. Many of the pilgrims went afterwards to Mecca to perform the third pillar of Hajj, which is Tawaaf al-Efadhah, a final tour around Kaaba. The pilgrims return on the first day of Eid al-Adha to their homes in Mina to spend the first night of the three nights of Tashreeq, as a prelude to symbolically stoning the devil three times before sunset on the second day of Eid. For the stoning ritual, pilgrims will be filing in to crowds through a multi-level structure housing three pillars symbolizing the devil. The ritual is an emulation of Ibrahim’s stoning of the devil at the three spots where he is said to have appeared trying to dissuade him from obeying God’s order to sacrifice his son, Ismael. Saudi Arabia’s King Salman made the trip to Mina on Tuesday and was seen on state-run television observing worshippers from the window of a high-rise. And in a rare move he took to Twitter to say it was a “great honour” to welcome the pilgrims to Saudi Arabia. The hajj retraces the steps of the Prophet Mohammad (PBUH) on his last pilgrimage to Makkah. 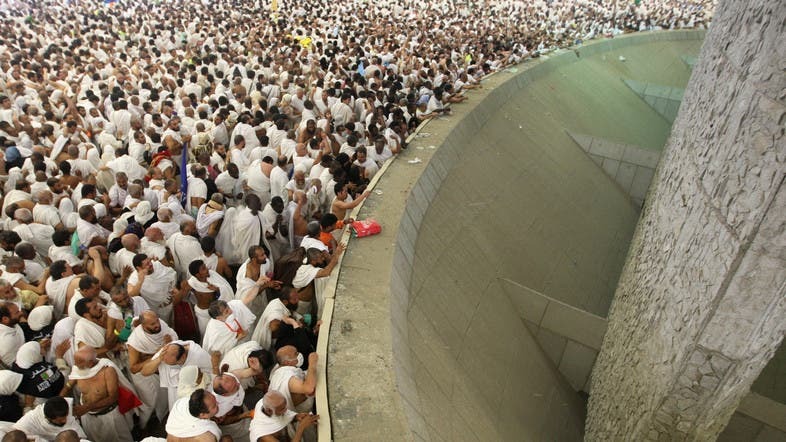 Muslim tradition holds that pilgrims must throw seven stones at a pillar representing Satan on the first day of Eid Al Adha, which comes after two days of prayer and meditation. Muslims traditionally slaughter sheep for the three-day Eid Al Adha, a tribute to the prophet Abraham’s sacrifice of a lamb after God spared Ishael, his son. Revenues from the coupons are considered “zakat”, or a charity donation, another pillar of Islam.